Photo Courtesy: Office the Parliament. Something is very wrong with the move by Finance Minister Colm Imbert to approve a loan guarantee of US$5 million to a private company called Grand Bay Paper Products Limited, through the EXIM Bank, and given the issues arising from the Panama Papers stories, this requires urgent investigation. 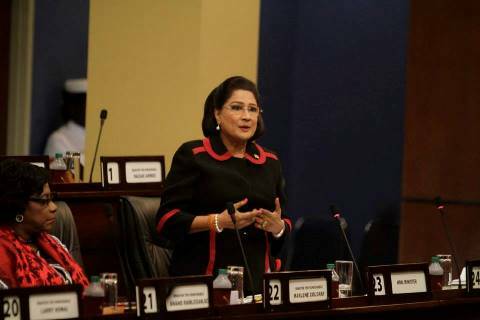 Persad-Bissessar revealed to Parliament that a review of the company’s documents showed that Grand Bay is owned by a St Lucian company, and Grand Bay’s Directors are non-citizens of Trinidad and Tobago.